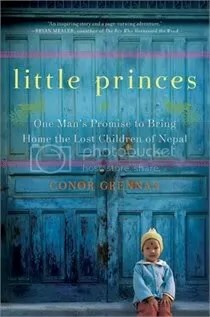 To kick off this post, the first book on my Craving’s list will probably have to be the book Little Princes: One Man’s Promise to Bring Home the Lost Children of Nepal by Conor Grennan. The synopsis is very simple and to the point but in that hook-line-and-sinker kind of way. Plus, I’m a sucker for the whole “One person can make a difference” thing. Besides those reasons, I chose this because I’ve been reading only fiction lately. I think a little change will do me some good and I’ve been trying to get my hands on a copy of this book for the longest time. Why it hasn’t happened yet, I don’t know, but I promise… SOON it will be mine! I haven’t been home in a while, it’s late and I realllyyyy need to get some sleep! This entry was posted in 2012, Book Wish List and tagged Book Blog, Book Cravings, Book Wish List, Books, Conor Grennan, JK Rowling, literature, Little Princes, Sam, The Casual Vancancy by dreamingwithink. Bookmark the permalink.